Ta da! Welcome to CandyDoll Couture! 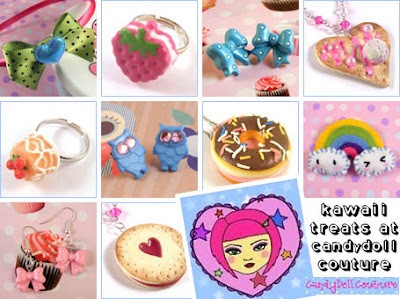 That’s right my kawaii hungry friends, at CandyDoll Couture you can pick up all your adorable goodies and treats in one fantastic shop - packed with everything from necklaces and brooches, to false nails and bag charms, and hairclips and stationery, to mirrors and purses, and lots, lots more besides! It’s like all our kawaii dreams have come true! Fantastic! Brilliant! It’s Big Fat Robot!